The elegant 5-star hotel is located in the centre of the exhibition city of Hannover. Its historic guise is mixed with a classical/modern feel-good atmosphere. The guests, who find the Kastens Hotel Luisenhof a peaceful haven to get away from it all, appreciate the salon atmosphere of its 146 rooms and suites. The historical building has been captivating its visitors ever since it was established in 1856 as a family property: the use of sensual mixers from Hansgrohe's PuraVida range, with its sense of lightness in white and chrome, makes for innovative bathroom design. The refined décor of the bathrooms is not confined to the wash basins: shower elements from the Axor Starck ShowerCollection complete the picture of exclusivity, and give the showers a sense of sheer pleasure. You can pamper yourself even more in the modern spa and fitness area on the top floor. From there you can look out through the panoramic window over the Altstadt (Old Town). 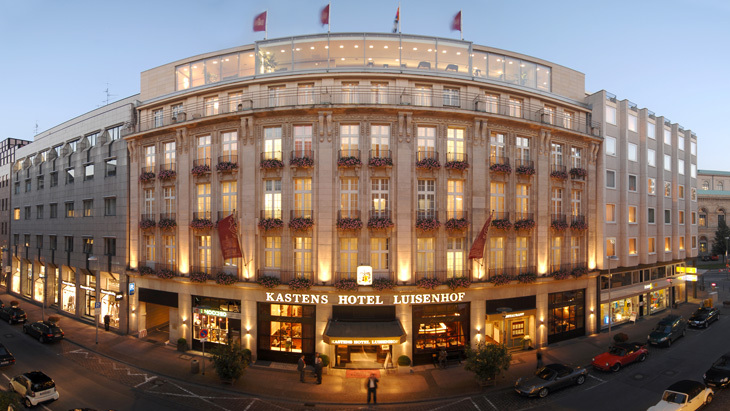 Thanks to its central location opposite the main station, Kastens Hotel Luisenhof is an ideal starting point for business travellers who want to visit one of the major trade fairs. The hotel itself provides stylish meeting rooms and conference halls. It also caters for guests with a high appreciation of culture: just a few steps away from the hotel is the Hannover State Opera.